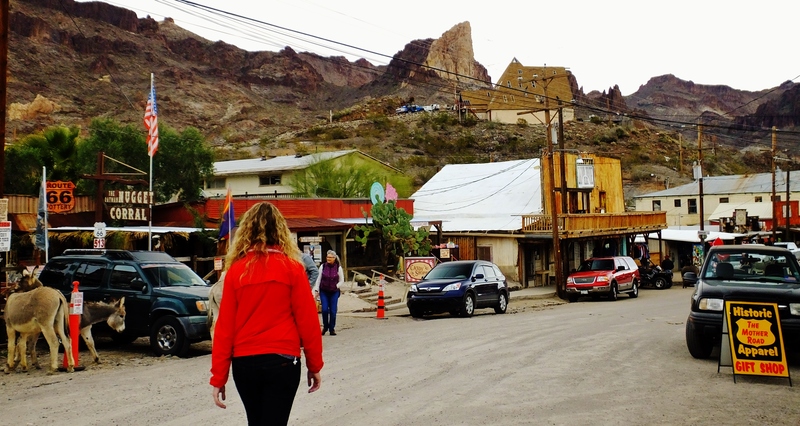 « EXPLORE ARIZONA – OATMAN, HOW DID YOU GET YOUR NAME? Have you ever wondered how a town earns its name? Is it local geography that inspires a town name? Could it be the first inhabitants or a colonial takeover that inspires the naming of a town? Have you ever noticed that 18th and 19th century American presidents have towns named in their honor? Founding father, Benjamin Franklin, is undoubtedly the most decorated American citizen with 50 municipalities, 32 counties, and one state. Is there a gender bias when it comes to town names? 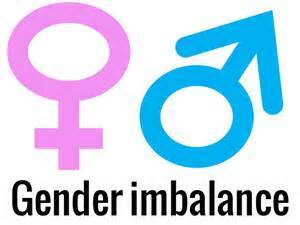 Historically, in male dominated societies, female centric town names tend to be few and far between. Considering women account for 51% of the U.S. population, women have inspired relatively few town names and even fewer once you eliminate saints, Greek goddesses, foreign queens, and early settler’s wives. Are there any American towns named after influential women? Olive Oatman appears to be the only shero who inspired a town name. 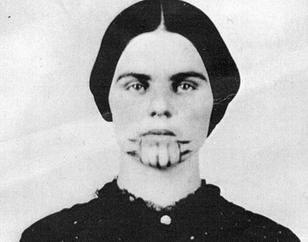 Olive Oatman was not my main motive for visiting Oatman; however, she did open my eyes to historical sexism and modern day misogyny. One hundred years ago, a ten million gold dollar discovery forever changed Oatman. 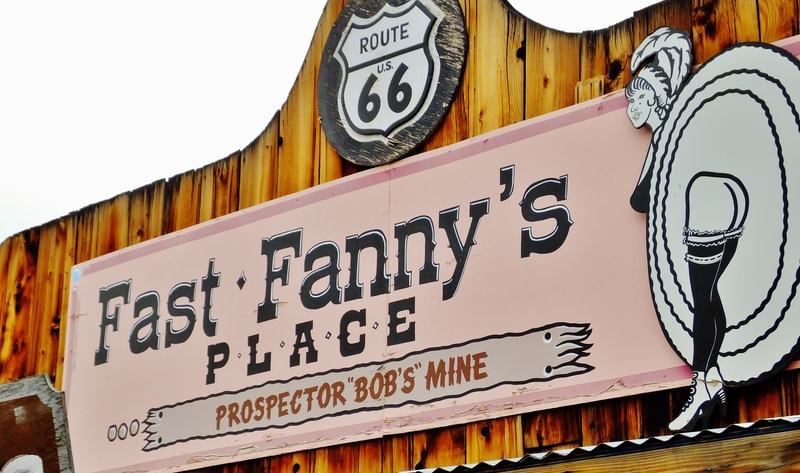 During the height of the gold rush, this Route 66 tent town was home to 10,000 miners. Today, with a population fewer than 200, it’s the wild burros and misogynistic billboards sustaining the living ghost town. Yes, I said misogynistic! What better way to honor the town’s namesake, than with store front billboards like this. 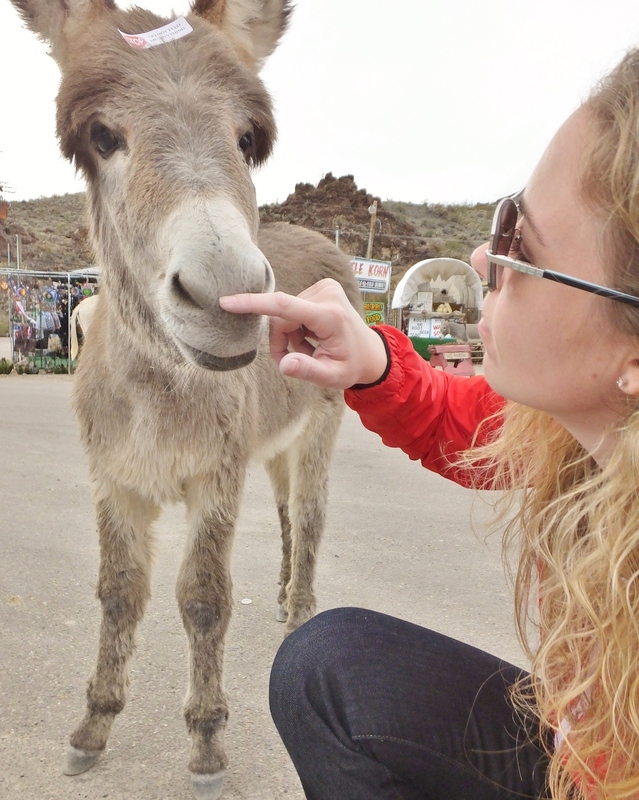 Perhaps only in Oatman, can tourists be greeted by wild burros and a “Glory Hole” sign. Was it just me, or have other visitors found the signs to be rather sexist and misogynistic in nature? The local gift shop won the award for the most disturbing form of sexism and misogyny. Who would buy this t-shirt? In what social setting would you wear this shirt? 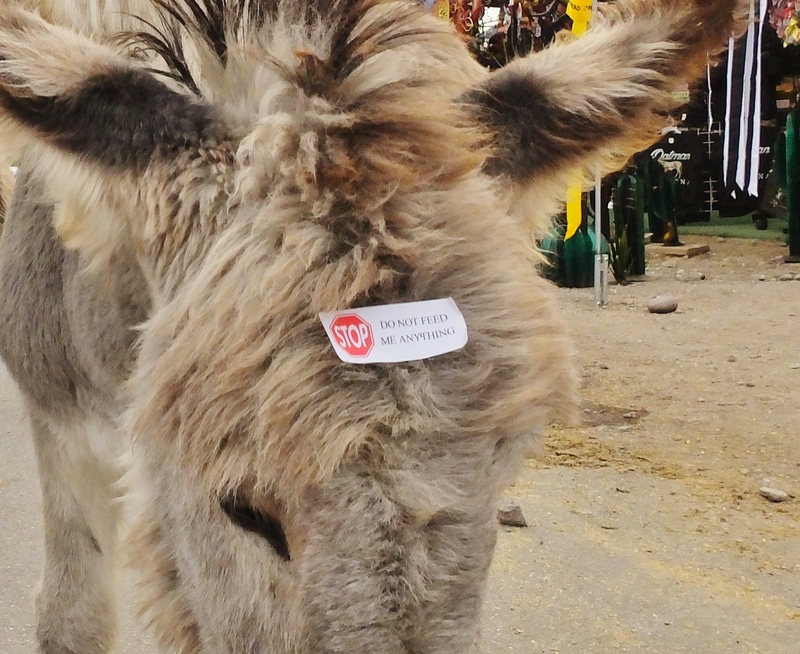 As mortified as the perfect stranger and I both were, we decided to focus on our main reason for visiting Oatman: the burros. With an estimated 1500 burros living in the surrounding hills, we found a few dozen roaming the main street. Be prepared, expect them to approach you, they are not shy! As tempting as it may be to feed the burros please don’t! 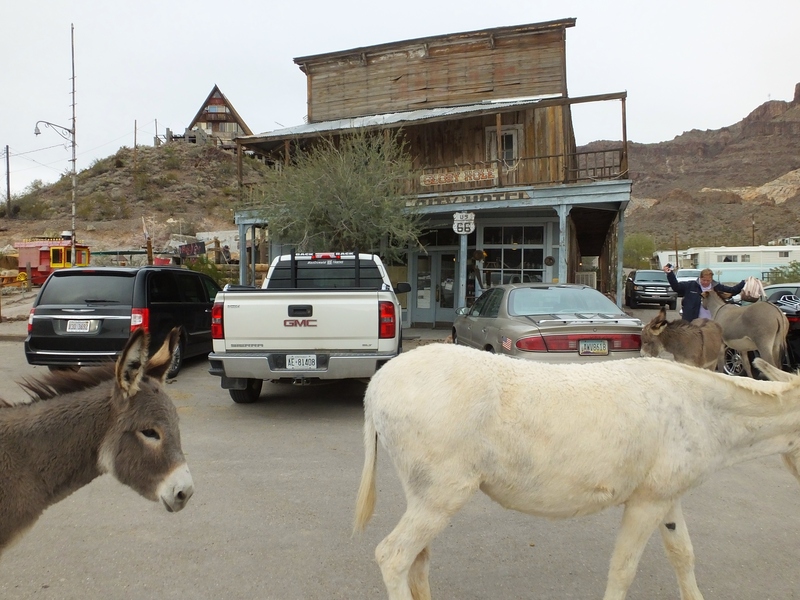 The Bureau of Land Management discourages feeding these Oatman icons. 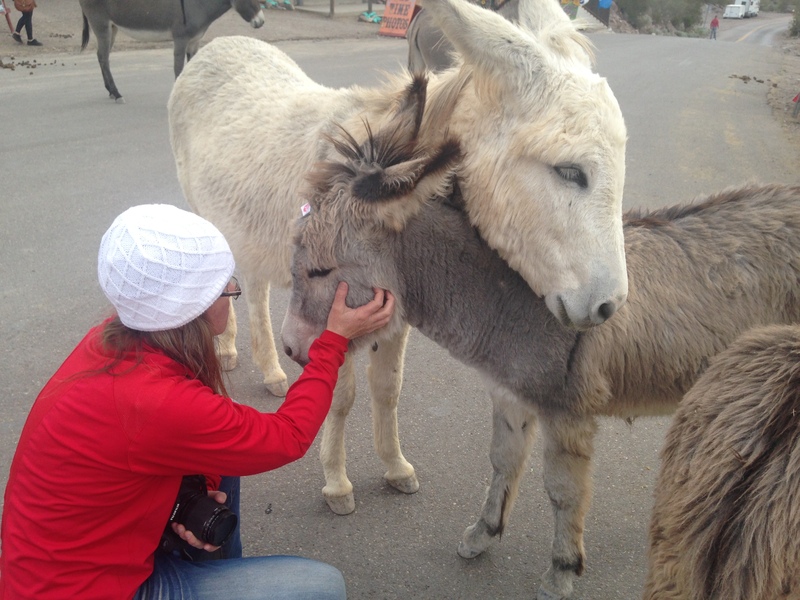 Local shopkeepers, residents, and visitors have overfed the burros; leaving many fat and sick. You know overfeeding has become a problem when you notice these interventional style stickers. 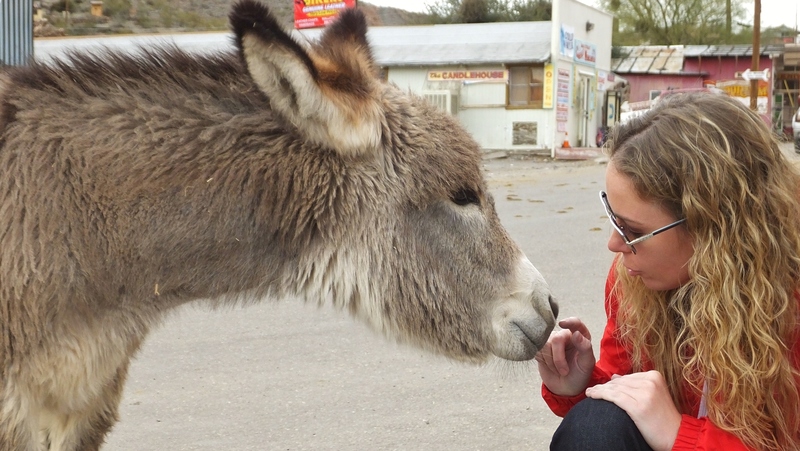 After our burro encounter, the perfect stranger and I continued our stroll through town. In some ways, our walk felt more like date than a friendly adventure. Is it really possible to establish such a close bond within a few short days? Was our newly found form of emotional intimacy shortening the distance between our sense of friendship and possible romance? Honestly, it would’ve have felt more natural to hold the perfect strangers hand than continue to do my shadow walk along side of her. I wanted to be closer, yet still be respectful of our developing friendship. Nothing goes unnoticed or unacknowledged, when you are spending time with a micro-expression maestro. “Circle, circle, shoulder rub, head hang, look away”; was the sing-song, the perfect stranger used to describe my new found body language. Lol, how embarrassing! Perhaps Paul Schrader was right; the secret of the creative life is to feel at ease with our embarrassment. 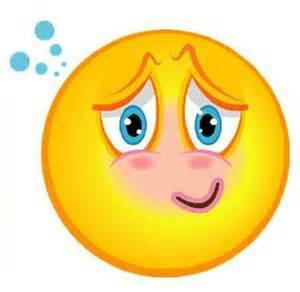 I would like to think I have made friends with my old nemesis: embarrassment. Oddly enough, it was a five year old girl that noticed our apparent connection and closeness. After noticing the two ladies in red, the young girl asked if we were sisters. Was it our matching red shirts that implied a sister bond? Could the young girl sense the probability of a potential romance? How do you tell a 5 year old that she had witnessed two women falling in love? With her mom right beside her, we told the young girl we were good friends, and left it at that! 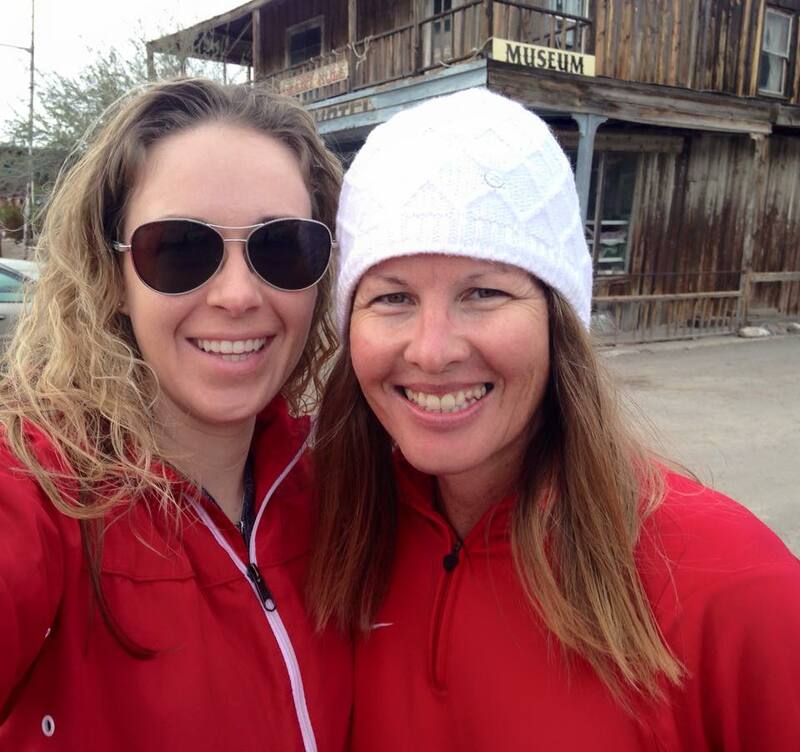 The perfect stranger and I headed off to the Oatman Hotel to grab an early dinner. It’s hard to believe that Clarke Gable and Carole Lombard spent their honeymoon here. Rumor has it, that Clarke Gable often returned to the hotel to play poker with the miners. While miners no longer play poker at the hotel, part of their history remains. 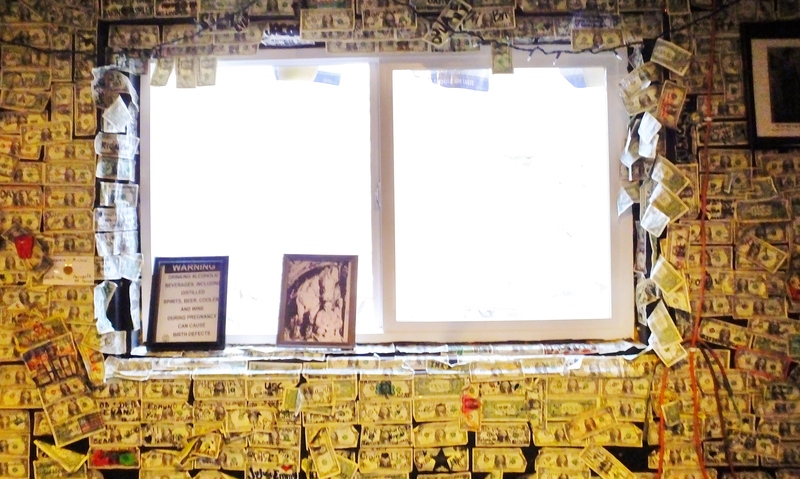 Throughout the restaurant, you will find thousands of dollar bills stapled to the wall. 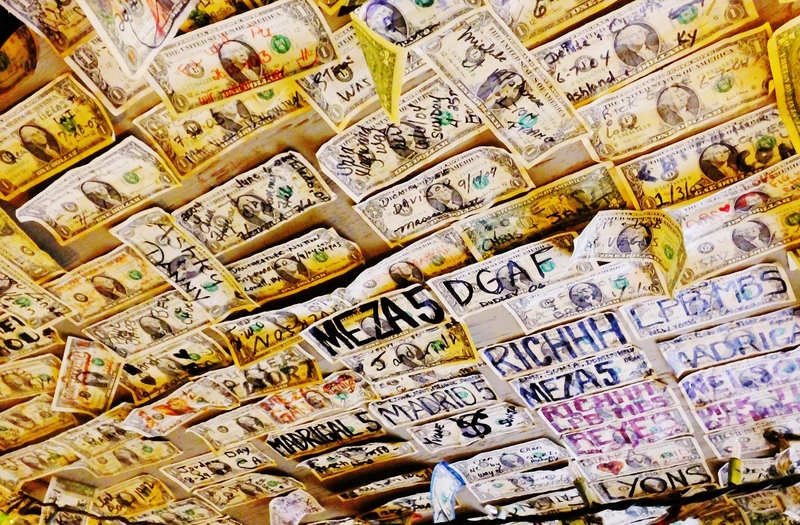 Consider it a souvenir to the past, because back in the day miners used to pay their bill on the restaurant wall. Perhaps this is the ultimate form of an honor policy, paying your tab ahead of time, just in case anything unforeseen happened to you during your meal. Like thousands of other visitors, the perfect stranger and I left our dollar bill stapled to the wall. 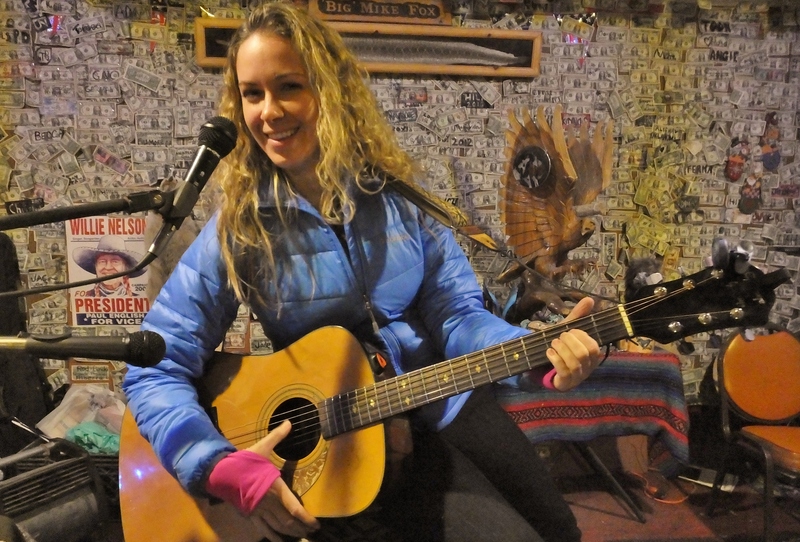 I also left Oatman with the “Circle, circle, shoulder rub, head hang, look away,” sing song playing in my mind. This Post was posted in REMOTELEIGH and tagged oatman hotel, olive oatman. Bookmark the permalink.